Aerial drones are one of the most promising and powerful new technologies to improve disaster response and relief operations. Drones naturally complement traditional manned relief operations by helping to ensure that operations can be conducted safer, faster, and more efficiently. When a disaster occurs, drones may be used to provide relief workers with better situational awareness, locate survivors amidst the rubble, perform structural analysis of damaged infrastructure, deliver needed supplies and equipment, evacuate casualties, and help extinguish fires -- among many other potential applications. This report will discuss how drones and the aerial data they collect can be used before, during, and after a disaster. It includes an overview of potential solutions and deployment models, as well as, recommendations on removing regulatory barriers to their use. 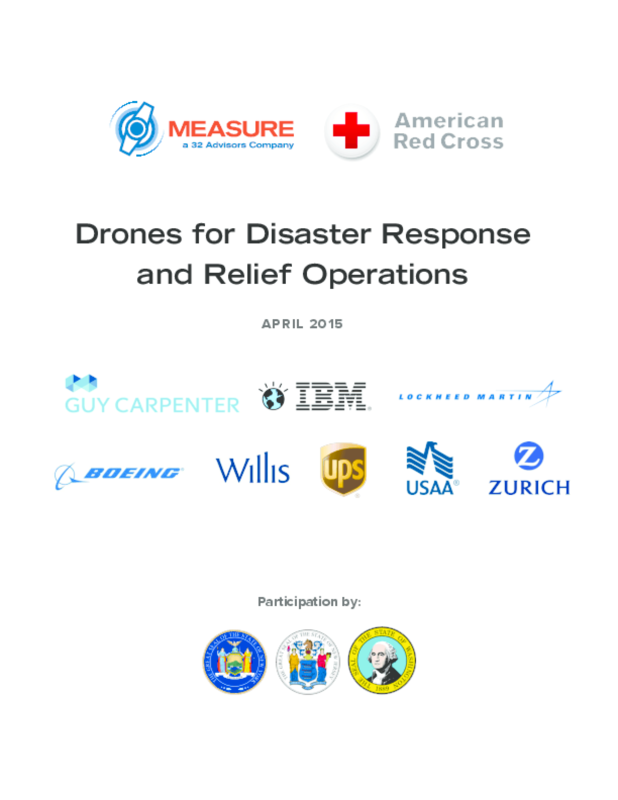 The American Red Cross, leading private sector companies, and federal agencies coordinated by Measure, a 32 Advisors Company, have come together to explore and explain how and why drones should be used in the wake of natural disasters and other emergencies that threaten widespread loss of life and property. Copyright 2015 American Red Cross, Measure.